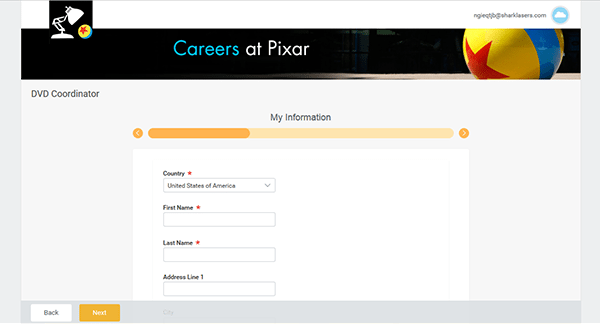 Go to the company’s main careers page to access the official Pixar job application. 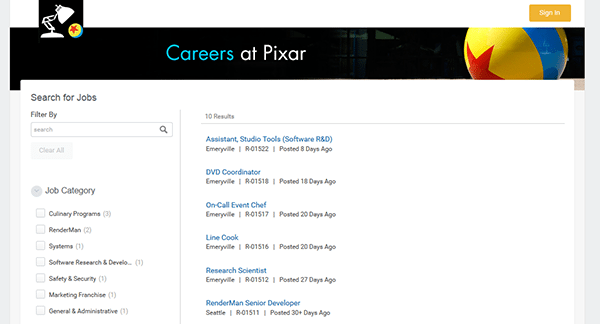 Numerous types of careers can be applied for on the Pixar jobs site including marketing, administrative, systems, studio, and security/research positions. Learn more about how to search for current openings, create an account, and submit an application in the guide posted below. About the Company: Pixar is an American computer animation studio headquartered out of Emeryville, California. The company was created in 1986 and is a subsidiary of The Walt Disney Company. 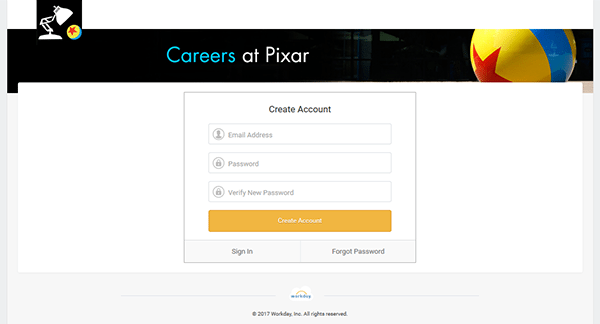 Step 1 – The first step of the online application is to go to the Pixar careers page. Press this link to open the careers page in a new tab/window. Step 2 – Scroll down the page and click the “View Career Listings” button to go to the main job search page. Step 3 – The list of job openings can be filtered by job category, location, or status (full/part-time). Press the link of the specific career that you want to start the online hiring process for. Step 4 – Read the job description page and then press one of the two “Apply” buttons near the top of the description section. Step 6 – Use the “Quick Apply” feature to import data from your CV/resume. Step 7 – Click the “Next” button at the top/bottom of the page to move to the next step. Step 9 – Click the “Next” button to continue, and then fill in the required information for each remaining step/section of the form.